Ruth Prowse School of Art has a vision to be a unique art school with a balance between tradition and innovation. The aim of the School is to strive for excellence and equity in the field of visual communication whilst developing the full practical and theoretical potential of each student. Ruth Prowse School of Art has a vision to be a unique art school with a balance between tradition and innovation. The aim of the School is to strive for excellence and equity in the field of visual communication whilst developing the full practical and theoretical potential of each student. Above all we aim to be a world-class environment that motivates original thought, self-realisation, creativity, visual literacy, cross-cultural artistic and educational exchange together with vocational and entrepreneurial skills. Our nurturing approach provides a conducive environment that enables each student to discover their own authentic visual language of expression. We are committed to an enriching open tuition with a policy of non-discrimination on the grounds of race, colour, gender or religion. Ruth Prowse School of Art is housed in the historic Roodebloem Estate in Woodstock and was founded in 1970 by the renowned artist and educator, Erik Laubscher. The School opened its doors to the first students in 1971 and remains committed to the founding principles. The purpose of the School is to develop the full creative potential of each student in conjunction with comprehensive practical skills within a vibrant creative environment. Classes are kept small for individual attention. The School has a solid full-time program, an extensive part-time program and in recent years an innovative and expanding outreach program to serve the wider community. A team of lecturers who are all practicing artists in their respective fields and have extensive lecturing experience present the courses. Diverse talents and interests combined with a guest lecturer program ensure that students benefit from this comprehensive body of knowledge. The interaction between student and lecturer motivates original thought and judgment, creativity, evaluation, management, together with vocational and entrepreneurial skills. Students benefit from a comprehensive body of knowledge, cross-pollination of ideas and approaches with innovation, professional time-management and valuable life-skills. Students are exposed to the industry with the opportunity to work shadow, engage in projects with real clients and freelance opportunities. The Ruth ProwseSchool of Art aims to develop visual literacy, exceptional practical portfolios, theoretical and research skills and consolidate all skills into a comprehensive inter-related body of knowledge. Ruth Prowse School of Art is also committed to serving the wider community and fostering a range of creative expression. The Outreach Program at the School was established to provide predominantly craft orientated tuition to adults from the community who has previously not had the opportunity to explore or develop their creative talents. The skills that would be developed can be used to generate an income and in turn share the knowledge that they have acquired with other adult students from their home communities. The Outreach Department functions within the framework of the full-time academic program, thus enabling a symbiotic relationship with the outcome of an interactive exchange of knowledge, skills and expertise. The Ruth Prowse Outreach Program aims to accomplish the following: A thorough practical body of knowledge with an applicable theoretical component. The course will enable students not only to share this knowledge with other students in the community but also to generate an income for the unemployed and thus utilize the course to its full advantage. 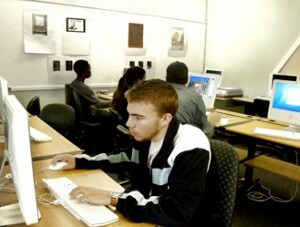 In addition, creativity and aesthetics are stimulated with valuable life skills. The School takes its name from and is dedicated to Ruth Prowse (1883 - 1967). Miss Prowse was an artist of considerable note and a staunch protagonist for the preservation of our historic heritage and buildings and the curator of the Michaelis Collection in Cape Town. The late Ruth Prowse bequeathed her property, “The Retreat”, for the establishment of an art and cultural centre. The trustees of the estate formally approved the founding of the Ruth Prowse Art Centre in 1970 by Erik Laubscher, the first principal, which was one of the only non-discriminatory art centres at that time in South Africa. The School is housed in the historic Roobebloem estate and has fully equipped studios and laboratories for students to ensure a quality education. All tuition is presented in English. Students may submit written in English or Afrikaans. Classes take the form of formal theory lectures, theory seminars, tutorials, practical briefings, demonstrations, lecturer contact during practical production classes, discussions, excursions, critique and feedback sessions. Ruth Prowse School of Art admits students of any race, colour, national and ethnic origin to all the rights, privileges, programs, and activities generally accorded or made available to students at the school. It does not discriminate on the basis of race, colour, national and ethnic origin in administration of its educational policies, admissions policies, scholarship and loan programs and loan programs, and athletic and other school administered programs. For the purposes of statistical requirements, South African students are requested to categorise themselves according to the following: African (Black African); Indian; Coloured ; Chinese; White; Other.